The recent rise of synth-driven music is a fascinating one, particularly its resonance with the metal community. At first listen, synthwave and metal don’t seem to have much in common — many don’t associate bass-dropping dance club rhythms with raucous riffing and clashing cymbals. But if you look and listen closely enough, you’ll notice the astoundingly deep impact that the musical and aesthetic legacy of the 1980s has left with both genres. For metal, the imprint left behind by the genre giants is felt in every guitar solo, bullet belt, and gore-covered album cover. For synthwave, it can be anything from glitzy neon font and lens flares to VHS tape static. But some synth artists employ occult (and even outright Satanic) imagery like bloody pentagrams and upside-down crosses, suggesting that they’re more self-aware of their relation to metal than you’d first believe. Two synth artists who I’ve thought have never shied away from their metal influences are Dance with the Dead (Los Angeles) and Carpenter Brut (France). Although varying wildly in musical style — Dance with the Dead loops undulating digitized basslines beneath arena rock guitar solos, while Carpenter Brut wields synth-based soundtracks of dystopian corruption and social decay — both are heartily embraced by many members of the metal community. Perhaps this can be attributed to both artists’ reliance on actual instruments: Dance with the Dead plays live with two guitars following pre-recorded backing tracks, while Carpenter Brut enlists a live guitarist and drummer and plays many of his synths himself. Regardless, they’re both among the more popular of the new electric echelon. I was lucky enough to catch both Dance with the Dead and Carpenter Brut playing on the same bill at the Union Nightclub in Los Angeles, CA in late March. There, I wondered just how much this crossover would translate to real flesh-and-blood attendance — and more importantly, how it would be received in a live setting. Scrolling through Carpenter Brut’s Facebook timeline beforehand revealed news of sold-out shows and alerts of venue changes to accommodate swelling numbers of ticket buyers. The Union had sold out mere hours before the doors opened at 9 PM, giving context to the tremendous turnout of black-shirted bystanders clinging to the sidewalk. It took half an hour just to make my way upriver. The Union itself resembled a hollowed-out hotel. The main foyer led up two flights of wide stairs, dumping attendees in front of a glittering bar stocked with glass shelves of alcohol. 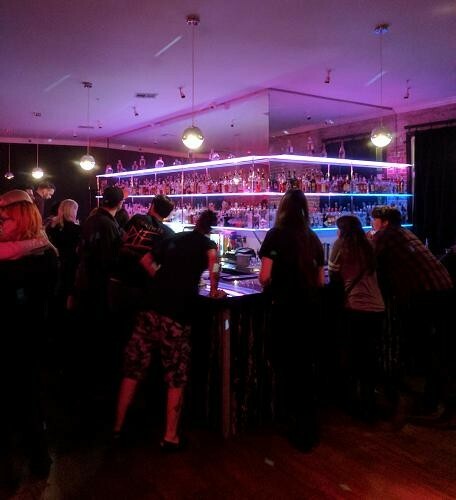 A wide merch area lay off to the right, and down a short hall illuminated by a neon pink sign was the main stage. Opening act Vogel was finishing up his set, and I and the scatterings of others near the back were treated to his evocative electronica synths. As he graciously thanked the audience and closed his MacBook — the typical synth artist’s weapon of choice — I shuffled ahead to try for a better view. The stage seemed rather low, and a ring of lights pointed puzzlingly inwards at the audience, casting others near me with a ghastly purple light. But I didn’t have to wait long until a large console was carried onto the stage and the glowing white icon of yet another MacBook came into view. Apart from their obsessive B-movie horror aesthetic, Dance with the Dead stands out from many of their synthwave peers. An LA duo consisting of Justin Pointer and Tony Kim, who both wield guitars and take on mixer duties, they wear their metal/hard rock influence on their sleeves by writing some of the most energizing, upbeat synth songs around. They have their ambient tracks, but most of their material is penned to get you pumped up. As one of the first synth-related bands I’d discovered completely on my own, I had high expectations for their set. After enduring an intro of Orff’s overused (yet somehow always acceptable) Carmina Burana, Dance with the Dead kicked off their set with Get Out, the ripping first track off their latest release “B-Sides: Volume 1.” I was instantly struck at the chunkiness of their live guitar tone, which surged ahead of the synths with the force of a Spartan shield wall. Not content to simply be labelled a novelty, Kim and Pointer performed their axe duties with the conviction of metal greats, flanking the sides of the stage and chugging with machine-like precision. That’s not to say they lacked stage presence — I was pleased to discover it was quite the opposite. Kim, who seemed to take point for this show both on the frets and the knobs, headbanged with eager energy — the showmanship of someone truly enthused, and perhaps more than a little thrilled, to be playing their own music live. For all its rough-around-the-edges atmosphere, the Union’s sound system didn’t disappoint. The crowd bounced up and down after potent bass-heavy buildups, and each time I could feel the floor beneath me start to give. More than once during Dance with the Dead’s set I wondered how long until the floor would open up completely and we’d all be swallowed into some gaping hellmouth hidden below. Maybe it’s just my metal tendencies showing, but I won’t shy from saying I greatly preferred the songs they played with live guitars to them manning the mixing console. And judging from the enthused cheers that erupted every time either Kim or Pointer slung a guitar across their shoulder, much of the audience did too. Several times throughout their set, the duo would doff their guitars and would fiddle with the assorted knobs and levers on the large console in center stage, changing dynamics like dropping the main melody during songs like Eyes of Madness to let the backing track shine or boosting the kick drum for a punchier passage. Since I was familiar with most of their songs, these subtleties weren’t lost on me, and I appreciated how they could manipulate the song rather than standing back and pressing “play.” Still, Watching You, my favorite song off their latest album “The Shape,” lacked the oomph of the other guitar-driven tracks. Sadly, I was the least enthused with the Dance-ified renditions of Queen’s We Will Rock You, as well as Metallica’s Master of Puppets, the latter of which closed the set out. It was my first time hearing these remixes, and I found them somewhat distracting — trying to discern what additions and liberties were made to renovate these classics took the momentum out of what had been a straightforward, rockin’ good time. Even so, I cheered along with the rest of the crowd when Kim stretched his smartphone out toward us, capturing footage of their hometown. All in all, I enjoyed their set quite a bit. But the night was just getting started. Early on in my synth discovery stage, I had pegged solo French composer Carpenter Brut as more unique than many of his ’80s-worshipping peers. To me, he seemed to defy the heart-thumping retro-futuristic atmosphere a la Perturbator and the neon ‘n’ sweatband jams of Com Truise — instead, he consorted with complex song structures with lots of memorable moving parts. Carpenter Brut didn’t just write soundtracks — he wrote songs. And although many other synthwave artists (such as GosT, or his fellow French countryman Perturbator) flirt with the idea of black metal as an influence, I always felt Carpenter Brut struck the closest to its throbbing heart with his twisting, multi-faceted song approach. But again, seeing it in practice was going to be a test of this theory. Once Dance with the Dead’s set concluded, chunks of people trickled off back toward the various bar areas, no doubt to quench their thirst after all that hot body rockin’. I took the opportunity to squeeze myself closer toward the front — but not by much. I finally began to feel the effects of the Union at full capacity, and as more aggressive concert-goers crammed themselves between scarcely seen gaps, I decided I’d gotten as close as I needed to. Besides, I was expecting a similarly swift setup time to that of Dance with the Dead. The additional gear of guitarist and drummer added what seemed an agonizing amount of time onto Carpenter Brut’s setup, which in turn provided plenty of time for every person who had left to be replaced by three more. The temperature rose, and so too did the anticipation for more synth meltdown. At 11:45 PM, the French trio proceeded to unleash the ultraviolence. And not a MacBook to be seen. From the moment the ominous opening notes of Escape to Midwich Valley reverberated through the house speakers, Carpenter Brut held the Union Nightclub in complete thrall. Hypnotic hues of red and white lighting splashed the stage like the grisly aftermath of a murder scene. Meanwhile, depraved imagery of zombie rituals and post-apocalyptic biker battles scrolled across the screen behind the band, adding cinematic context to the music. And on the stage, the three-piece played on and on, seamlessly transitioning from one blood-soaked song to the next. The drummer was the epitome of energy, hammering his hi-hat with 16-note disco-beat patterns and staggered tom rolls, effortlessly emulating the digitized drums off Carpenter Brut’s essential three-part EP collection, “Trilogy.” The guitarist also added his instrument to the mix, complementing the synths by bolstering their attack with a hard, distorted edge. And commanding a multi-tiered rack of electronic modules, as well as a short keyboard for his leads, the Brut himself seemed subdued, yet held a confident air about him. It was clear that this was his show, and everything the audience felt — the electric energy, the abrasive beats bursting beneath the surface of songs like Division Ruine, Roller Mobster, and Looking for Tracy Tzu was an expression of his vision. Over the course of the next hour, the intoxicating synthesized melodies and pounding rhythms surged through us. I could feel my blood boiling during 347 Midnight Demons — by Le Perv I felt ready to riot. (Or maybe that was from foolishly wearing jeans in a venue with no windows or air conditioning.) Either way, the electronic onslaught was non-stop, and the audience responded by headbanging and jumping up and down. I saw plenty of raised smartphones attempting to immortalize the essence of that night, but I saw more than a few heated mosh pits, too. Both were indicative to me that although this show was probably unlike anything most people expected they still knew how to enjoy it. The set ended with Michael Sembello’s She’s a Maniac (yes, from “Flashdance”), complete with Carpenter Brut-ish breakdown. I felt puzzled — another cover for the final song? — but it was then that I began to realize how important the ’80s musical influence was to both them and Dance with the Dead and to be able to pay homage in that way. I felt humbled, and it made me appreciate just what it probably meant for both groups to be playing their versions of the songs they grew up with in front of their own wild, raving fans. Dance with the Dead was entertaining. Their showmanship and fan service in the form of popular rock songs and crowd-pleasing photo ops proves they’ve got their collective finger on the pulse of what makes live performances so dynamic. They could easily have acted the same in a proper metal band and have been received just as well. 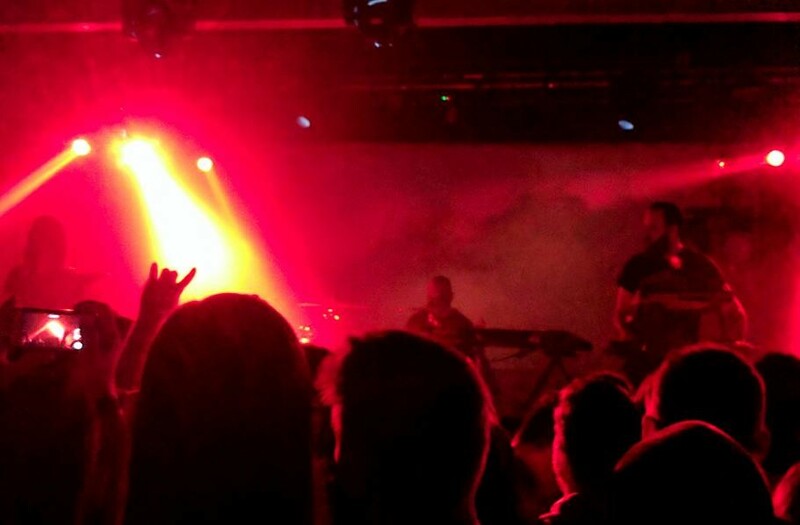 But when I think back on that night, I think of Carpenter Brut and their authentic approach to performing live as a synth-based band. They weren’t there to impress us — we weren’t fed any self-indulgent guitar solos meant to drive us into a fret-loving frenzy, and the mini drum solo during Disco Zombi Italia solely served to augment the atmosphere. No, Carpenter Brut didn’t try to “trick” us into seeing them as anything but what they were: a legitimate band, who uses synths but isn’t carried by them, who successfully — and impressively — melds the two worlds of metal and electronic together. Whenever I see Carpenter Brut live again — and I do hope that’s very soon — I won’t think of them as a synth artist who plays with a live drummer and guitarist — I’ll think of them as a retro-futuristic vision of what can be accomplished with live music. They may straddle the line between two disparately related genres, but what they bring is so unique I can’t recommend enough that you seek it out and try it for yourself.